This month’s newsletter contains reports from two recent events: a parallel session held at this year’s International Forum for Sustainable Asia and the Pacific (ISAP 2015) on 29 July 2015 in Yokohama, Japan; and the Satoyama Initiative Regional Workshop in Africa, held from 10 to 12 August 2015 in Accra, Ghana. We are also pleased to share news of a recent podcast about the Satoyama Initiative and a recent IPSI case study from the Hokusetsu Satoyama Museum Steering Council. The Workshop brought together around 75 participants from 13 African nations and around the world for in-depth discussions of the issues facing SEPLS particularly in Africa. The event was co-organized by the IPSI Secretariat and, from the Government of Ghana, the Ghana National Biodiversity Committee, the Forestry Commission of Ghana, and the Ministry of Environment, Science, Technology and Innovation (MESTI). Local cooperating organizations A Rocha Ghana and Conservation Alliance also provided assistance in its organization. The opening ceremony featured guest addresses by the Honourable Dr. Bernice Heloo, MP for the Hohoe Municipality and Deputy Minister for Environment, Science, Technology and Innovation (MESTI) of Ghana, and Daniel Pelle of the Forestry Commission of Ghana. The event was Chaired by Prof. Alfred Oteng-Yeboah, Chair of the Ghana National Biodiversity Committee, with plenary discussions moderated by Dr. Wanja Dorothy Nyingi, Coordinator of the Kenya Wetlands Biodiversity Research Team and Dr. Maurizio Farhan Ferrari, Environmental Governance Coordinator at the Forest Peoples Programme. Keynote speeches were provided by Prof. Kazuhiko Takeuchi, Senior Vice-Rector of the United Nations University, Dr. Tanya Abrahamse, CEO of the South African Biodiversity Institute (SAMBI) and Prof. Alfred Oteng-Yeboah, Chair of the Ghana National Biodiversity Committee. These were followed by working group sessions, where participants engaged in in-depth discussion of SEPLS in Africa. Building on the success of this event, the IPSI Secretariat looks forward to working more intensively at the regional level and organizing further Regional Workshops around the world in the future. The IPSI Secretariat also plans to produce a publication about SEPLS in Africa in addition to the official workshop report, which will be available on the IPSI website soon. For more information on the Workshop, including presentation files, please see the IPSI website here. The International Forum for Sustainable Asia and the Pacific (ISAP 2015) was held on 28 and 29 July 2015 at the Pacifico Yokohama Conference Center in Yokohama, Japan. ISAP is a major event held each year, with speakers on sustainability from around the Asia-Pacific region and the world. The theme of this year’s event was “Solutions for Change: Forging Multi-stakeholder Partnerships towards 2030″, with a focus on the Sustainable Development Goals (SDGs) and climate change. The event was also featured in detail on the ISAP 2015 website here. The Good Land Project is an Australia-based website “about cultivating life from land”, and featuring a number of articles closely related to the Satoyama Initiative and SEPLS. It recently published a podcast featuring Matthew Cawood interviewing William Dunbar of the IPSI Secretariat about topic ranging from the origins and development of the satoyama concept in Japan, to activities under the Satoyama Initiative and IPSI, to sustainable consumption in general. The audio and a transcript of the podcast can be found at The Good Land Project’s website here. The IPSI Secretariat recently received a case study report from partner organization the Hokusetsu Satoyama Museum Steering Council, titled “Hokusetsu Satoyama Leader Training Session”. 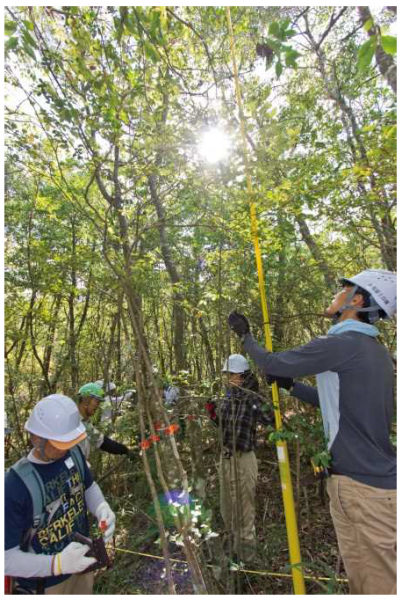 Since its establishment in 2012, the Hokusetsu Satoyama Leader Training Session has aimed to acquire a deeper understanding of Japan’ssatoyama landscapes and develop active human resources for enhancing satoyamaactivities. Satoyama forests in the Hokusetsu region, located near urban areas in Hyogo Prefecture, Japan, are unique in that they have maintained their traditionalsatoyama landscapes and contain various virtues, such as history, culture, and biodiversity, as well as in that many citizens in this region are taking part in a wide range of activities related to thesatoyama forests. The Hokusetsu Satoyama Leader Training Session was launched in fiscal 2012 with the aim of acquiring a deeper understanding of satoyama and developing active human resources forsatoyama activities. Targeted at current and future satoyama supporters, including forest volunteers and environmental organization members, Hokusetsu Satoyama College aims to develop generalistic human resources through its entire curriculum, ranging from introductory lectures to application classes focusing on practice, which provide participants with opportunities to study, experience, think about, and communicate with satoyama and satoyama people, and finally to contribute to the sustainable conservation and vitalization of Hokusetsu satoyama.